We get the Wall Street Journal (paper edition) and while I was glancing through it I noticed this Lamb Chops with Coconut-Curry Potatoes and Spinach recipe and thought I’d try it. It was delicious, to say the least, and will be one of my regular “go-to” recipes. I reduced the recipe since there was only going to be two of us eating and also used sweet potatoes instead of new potatoes. The recipe you see below is my adaptation to make sure it’s paleo but almost everything is from the original recipe. I chose to bake instead of the broil the lamb chops also. These are the spices you’ll be using. I used small lamb chops that I purchased at Costco. You’ll be marinating them in olive oil, salt and garlic. 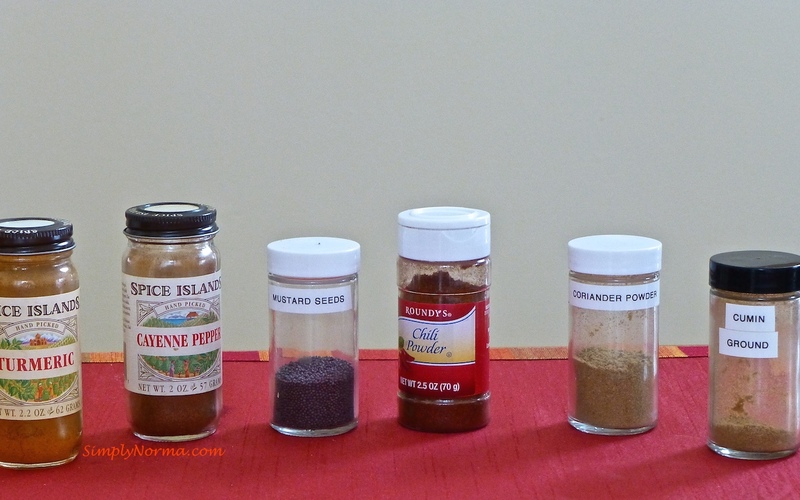 For the side dish, these are the main ingredients (besides the spices). You’ll be adding some olive oil to the bottom of a large pot, then the cumin for about a minute and lastly the sliced onion. The original recipe calls for thin sliced onions but I thought thicker would be better. 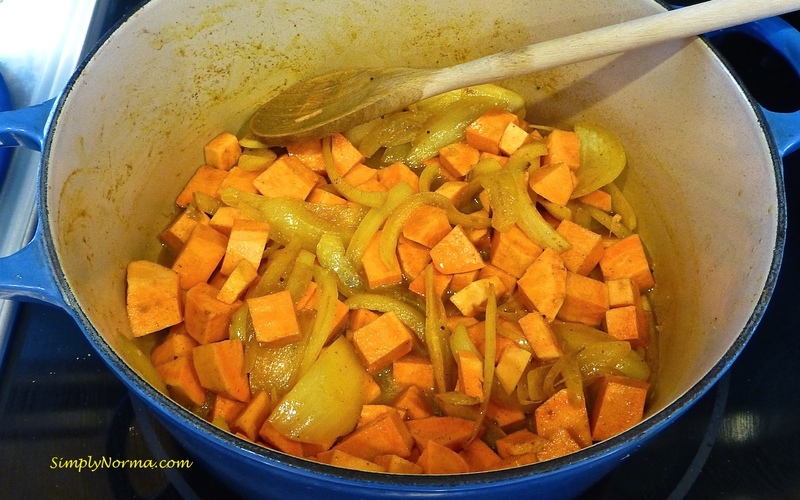 After the onions are soft (takes a few minutes), you’ll be adding the turmeric, mustard seeds, chili powder, coriander and the remaining cayenne pepper and salt then stirring until well combined. Let this cook through for a couple of minutes. Then you’ll be adding the potatoes and water. After the potatoes are almost cooked through (5-10 minutes depending on your heat setting), you’ll be adding the coconut milk and continuing to cook the potatoes. You don’t want them too soft though as you want to be able to eat them with a fork. 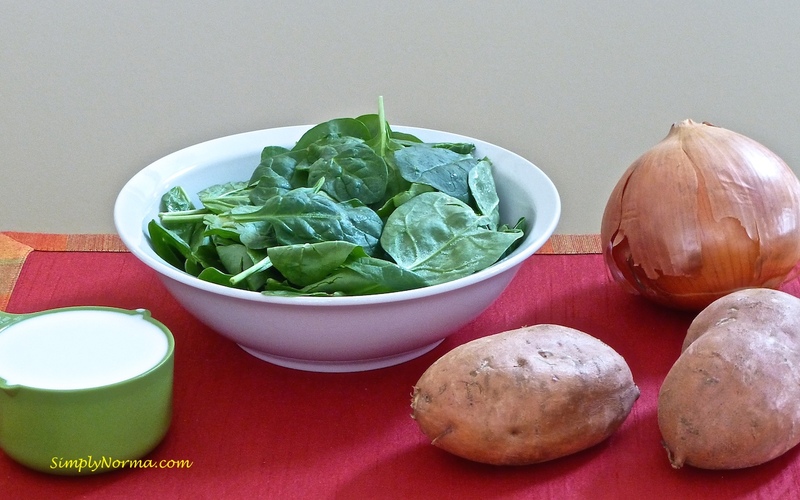 Next you’ll be adding the spinach until it’s just wilted. Ready to try this wonderful recipe? 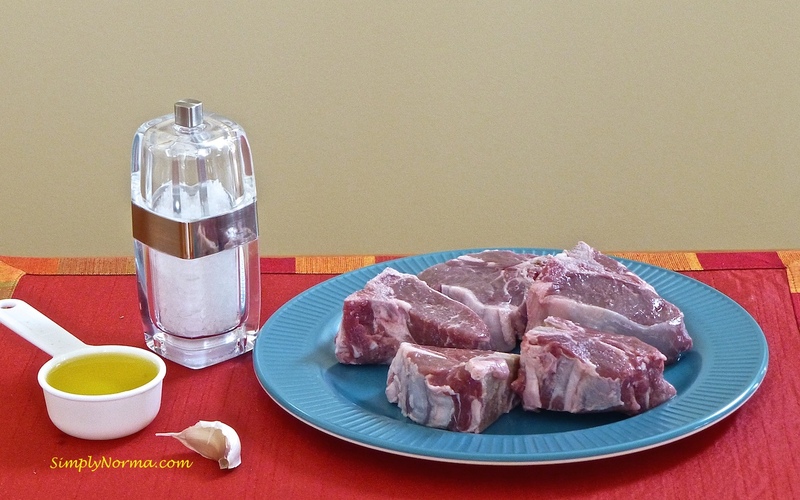 In a large bowl, add the lamb chops with 1/4 cup oil, 1 teaspoon salt and garlic, making sure to coat them thoroughly then set them aside to marinate. In a large pot (that has a lid), add the remaining oil and heat on medium heat. Once hot, add the cumin and fry about 1 minute. 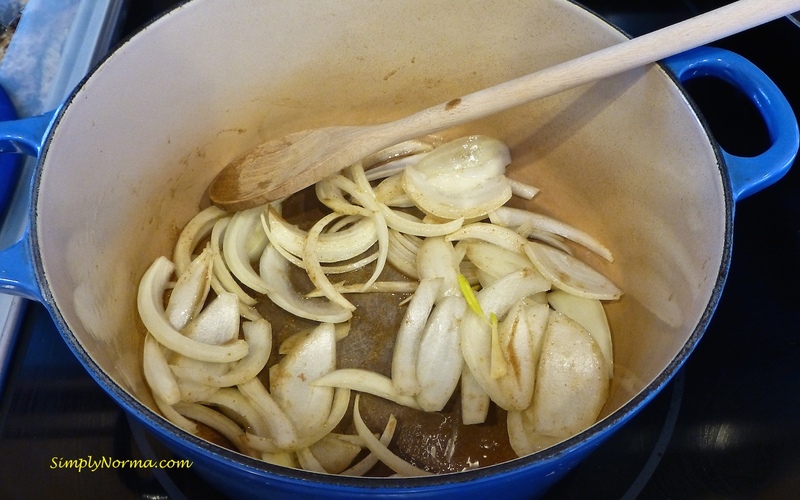 Add the onions and sauté until soft and browned, 8-10 minutes. 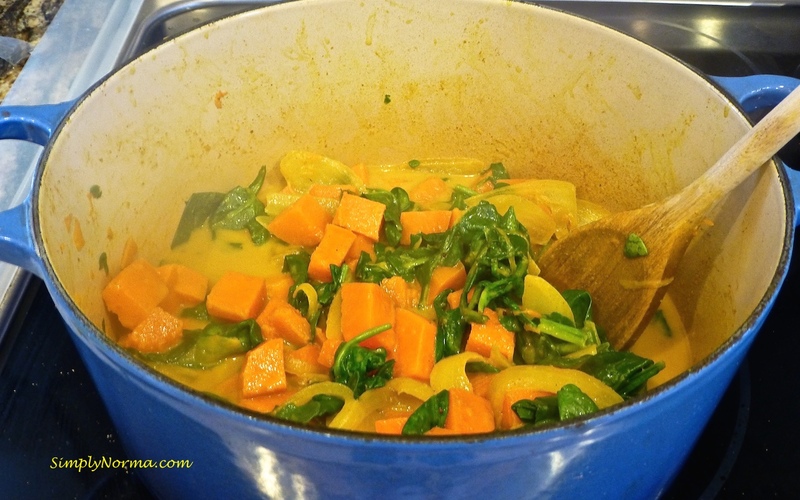 Stir in the turmeric, mustard seeds, chili powder, coriander, cayenne pepper and 1/2 teaspoon salt until combined. Fry the spices for about 2 minutes. Add the potatoes and water to the onion mixture then stir, cover and simmer until the potatoes are almost tender, about 10 minutes (but check every few minutes). After the potatoes are almost tender, stir in the coconut milk, replace cover and cook until potatoes are just fork-tender, about 5 minutes. Stir in spinach and cook until just wilted, about 2 minutes. Cover and set aside. Once the lamb is cooked through (I use a meat thermometer to make sure they come out perfect for me which is well done and medium for my husband — his normally come out first), remove them from the oven and serve with the Coconut Curry Potatoes and Spinach. The chef of this recipe that I found in the Wall Street Journal is Meeru Dhalwala. Very nicely done! 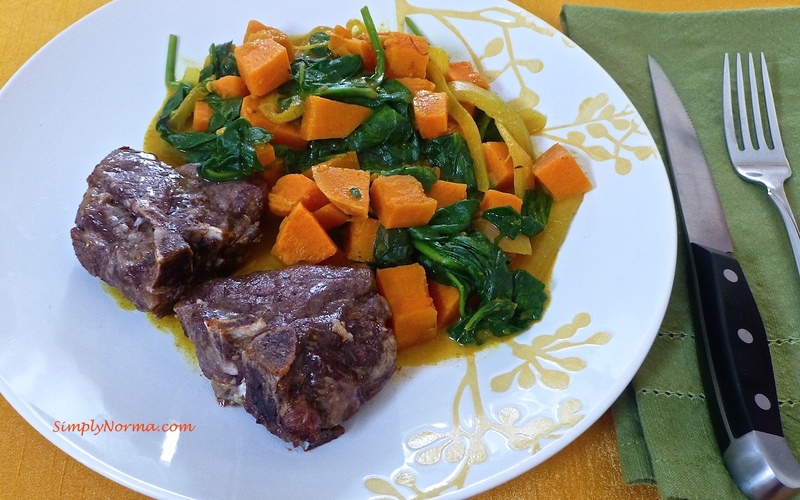 Side note: Wiki has a really nice site that shows different ways to cook lamb. Click here to view the site.